Firms in the US are marketing knee implants specifically designed for women, reports Orthopedic Technology Review. So, it’s great that an implant is being designed for women, right? 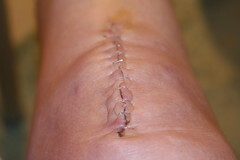 Well, according to this article, women make up 60% of all cases of knee-replacement surgery. You’d think they’d have actually come up with an implant that fits before this, rather than shoving in ones designed to fit the minority of patients. The average age of his female patients is 64, and he has his own theories as to why women are more in need of knee implants than men, beyond the longevity issue. “I think child-bearing may be a contributing factor, creating more stress on the knees than we caregivers realize. I also think women, as the primary caregivers in their families, don’t have a lot of time in their schedule, so they put off a problem that might be solved or delayed by conditioning and exercise until it’s too late, and surgery is then needed,” he says. On the other hand, Yates says, “I’m equally happy with the results of men whom I’ve used the product for.” And for both genders, he particularly likes the product’s ergonomically favorable design that increases flexion (bending of a joint) and the attention given to the relative constant center of rotation.